At Curve, we know the business of Dentistry goes far beyond scheduling, charting and billing and requires providers to keep on top of the pulse of their practices by focusing on critical financial and operational indicators. 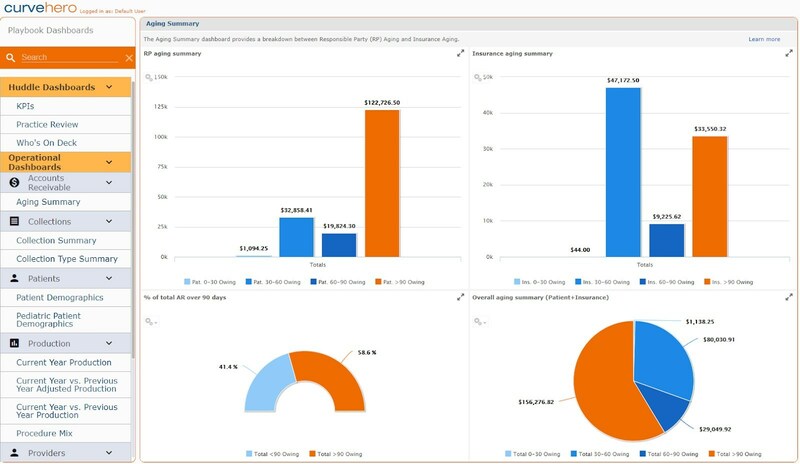 Until now, the only options to understand the numbers that drive your business were to either buy expensive, stand-alone business intelligence software and engage their staff to interpret the data, or make do with the limited reporting and dashboard functionality provided in their Practice Management System. With this in mind, we designed Curve Business Intelligence to provide dental practices of all sizes with easy to understand views into the financial and operational health of their practices as part of their Practice Management System. A dentist should not need to pay thousands of dollars a year or add an MBA to their list of diplomas in order to run a successful practice using their own data. Gary Long, Chief Revenue Officer of Curve Dental, explains Curve's emphasis on redefining what a Practice Management System should be to include critical features like Imaging, Patient Engagement and now Business Intelligence, all delivered through an integrated cloud platform. "We believe as a Practice Management Platform, it is our responsibility to provide dental practices with the tools they need to effectively and efficiently run their practices in the cloud. The addition of Curve Business Intelligence allows practices to unlock the data that each provider securely stores in our system every day and serve it up to them in a straightforward way, allowing them to run a more profitable and healthy practice." Long continues, "Our philosophy at Curve is — you should expect more from your practice management system — and at Curve we are determined to deliver more." Founded in 2005, Curve Dental delivered the first cloud-based, enterprise level practice management platform to the dental industry and has continued to drive innovation in the dental software space ever since. In 2018, Battery Ventures recognized that Curve Dental was uniquely positioned in the market to deliver more to dental practices because of their superior cloud-based platform built on AWS, deep dental expertise and a singular focus on delivering exceptional Practice Management Software and customer support. The investment Battery made in Curve has allowed Curve to build a leadership team with extensive software expertise and a vision of redefining Practice Management software as well as to commit to investing over $40 million into the Curve platform over the next five years. Today, Curve has over 20,000 users in the United States and Canada with offices in Orem, Utah; Calgary, Alberta; and Atlanta, Georgia. Learn more at www.curvedental.com.